Same thing in Czech huh? Only in the past tense: mál sem radost (I was happy - man) / mála sem radost (I was happy - woman). But I'm not quite sure: I've only scarcely learned it. Not a problem in Chinese. Both male 他, female 她, and it 它 are all pronounced the same way, "ta1". That's the only thing distinguishing gender when referring to a person, nothing in the sentence structure is changed. Oh and Me is just 我, doesn't matter the gender. But Finnish is the easiest of all, there is absolutely no gender in verbs, nouns nor pronouns. One less thing. Ha. Don't forget about formal and non formal. 你 vs 您，for saying you, and the proper nouns to call any random strangers. Its confusing, but gets easier the more you study it. You should really look into learning it! As a native Russian speaker, I find it surprising and odd, when girls deliberately use the masculine forms when speaking to each other or their friends. They might want to sound more independent, or convincing, or strong, I really don't know. Maybe it's just a desire to make the language forms more "universal" and not gender-oriented like in English. In japanese you have the same for "I" each one more feminine or masculine, also depending if slang or not. 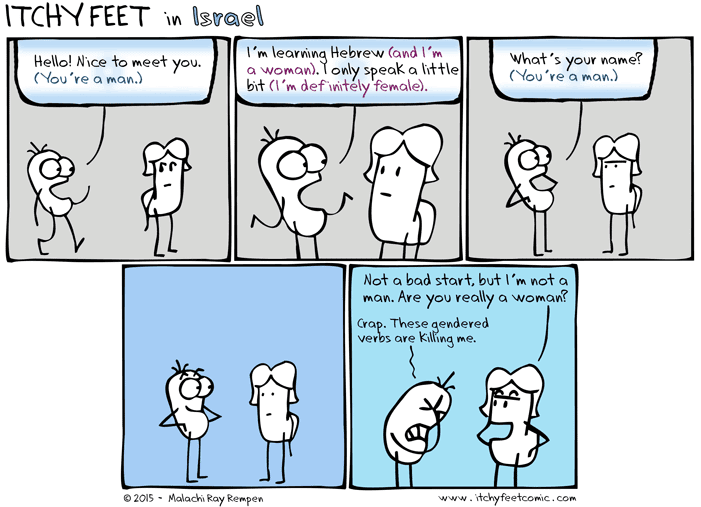 I'm Israeli-American, my Hebrew isn't great, so many Israeli's will speak to me in English. Enjoy your stay. Yeah but that's no fun! I was thinking that could happen in Japan ... but it couldn't! Polite Japanese (--> introduction) has very little gender cues. So it would have to be a situation where both parties know each other well and are of equal social standing. Malachi, if your comics make me think for more than half an hour about this and other language issues, you are definitely doing something right. Looking forward to the next one! Thanks Erik - my goal is to make you think SO much about these things that your brain will leak out of your nose. I am Israeli/American and when I teach people Hebrew this is what they say "Hello! I am a microwave!' Were are they getting microwave from?!? Maybe you've been teaching Hebrew to microwaves this whole time. LATEST CONSPIRACY THEORY: ARE PEOPLE MICROWAVES?